Please note new holding tank and pumpout certifications required for all vessels in Rhode Island waters. Click chart to enlarge. Not for navigation. Wickford is a lovely little harbor and the quintessential Rhode Island fishing village. The latitude of Wickford is 41.573N. The longitude is 71.461W. Given the prevailing southwesterlies in Narragansett Bay, it is usually a nice broad reach across the bay. 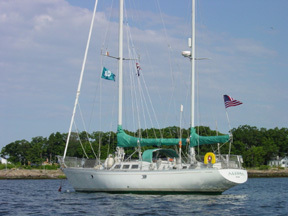 Wickford has several good marinas, a mooring field in the outer harbor which is well protected, and lots to see and do. The harbor is known for shoaling. Keep your charts and your wits about you. There are areas that are quite shallow, but the central mooring field has depths of about 7-12 feet. The town moorings are first come first serve. You can contact the harbormaster on VHF Channel 65 for instruction to the moorings as you approach. The town maintains a nice dock at the head of Wickford Cove, just off Main Street and easy walking distance from several restaurants and an interesting mix of shops. You can tie up for up to two hours without charge. As you enter the outer harbor through the breakwater, look to port to see Wickford Light, constructed in 1831 and now a private residence. Be aware that the entire harbor is a No-Wake zone. A little further, the channel splits. The Wickford Shipyard, Brewer’s Wickford Cove Marina and the commercial fishing dock are to port. The town dock is at the head of the cove on this branch. Wickford Marina and the boat ramp at Wilson Park are on the starboard branch. Be aware that it is very shallow - very shallow! Wickford Harbor is a busy place, with many moored boats, kayaks, sailing dinghys, commercial and recreational fishing boats, and tenders going every which way. If that isn’t enough, you may want to visit during the annual art festival (second weekend in July) or the International Quahog Festival in August. Or pick a quiet weekend after Labor Day and just soak up the atmosphere. It was the inspiration for John Updike’s famous book, The Witches of Eastwick. Gilbert Stuart, whose portrait of George Washington graces the $1 bill, grew up here. There is much to imagine. Pleasant Street Wharf, a marina located between Wickford Marina and the Wickford Yacht Club to port just beyond G C “9” is family-owned and family-oriented. It’s a friendly place that will accommodate, somehow, any visiting cruiser. They have heads, showers, ice, gas and diesel available. There are grills on the dock and on any night there are people cooking there. Just bring your food and join in the fun. Even if you forget your food you will eat if you want to, as everyone shares. The town itself is truly lovely, spanning the harborside and offering great provisioning amenities right at the dockside. There is a supermarket, a liquor store, a bakery and various other supplies a stones throw from the dinghy dock. There are also a good collection of jewelry, silver, glass and gift shops to provide diversionary options for browsing. And be sure to take the little ones to The Toy Cellar on Main St. The town is well preserved and maintained and a joy to visit. We especially like the Harborside Grill for lunch, next to Ryan’s Market. Wickford Yacht Club can be reached at 401-294-9010 and monitors channel 9. Contact the harbormaster regarding town moorings at 401-294-3316 x 255 and VHF channel 65. Wickford Marina is at 401-294-8160 and channel 10. Brewer’s Wickford Cove Marina offers launch service on VHF channel 9.